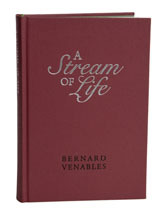 Bernard was one of Waterlog’s earliest contributors; a pairing about as inevitable as Redmire and carp, in the scheme of things. Now he has moved on, leaving us a life compressed into 388 pages. The manuscript was edited after the author’s death and the nearest thing I can compare it to is a very old wine; fading yet still lush and memorable. Bernard starts with his memories of the Edwardian era: gas mantles and lavender sellers; and finishes with a trip to the Palace and a spot of pike fishing. In between he packs in more experiences than most of us could hope to have in several lifetimes. The book isn’t all about fishing, there is a great deal about Bernard’s war time experiences and the days in Fleet Street; a cameo of Jack Hargreaves’ prophecy that Mr. Crabtree would sell a million copies; the Angling Times; Creel; whaling in the Azores; Africa; Kathmandu. And there is regret, a rich thread that links many of the stories together, seen as they were at the end of a long, adventurous and at times very hard life. There will never be another Bernard. I don’t think he ever intended to do so, but he bestrode twentieth century British angling, and if his prose style became a little challenging in his later years, well, so what, I think he had earned the right. There are things here of which you and I have not yet dreamed. The illustration shows the limited edition, now sold out - the book has been reprinted as a trade edition.